Many moons ago my parents, (who own Perfect Magic) used to host a magic convention in Montreal each year. It was a big deal some of the biggest names in the industry would attend. I won’t list them here as most of you are not magicians so it wouldn’t really mean anything to you, and those that are magicians can click here to get the full list. After the convention we would have a party with the invited guests (magic dealers, lectures, performers and friends who helped us out) and have a grand ole’ time. Fate Or Circumstance, Part 3 Never Look Back. Once at Sandra’s we found the kennel, made sure Husky had food and water, we promised her that Sandra would be home soon and that we would visit during the week, and with great reluctance we walked away. Husky screamed! She didn’t bark, growl or howl, she screamed. Never had I heard such a noise, it sounded like somebody had taken an old rusty spoon and used it to carve out her heart. We couldn’t take her with us and we couldn’t wait all night. Husky was safe, she had water and Sandra would soon be there to take her inside. Being the cruel heartless people we are we walked away with heavy hearts and tears in our eyes and the most horrific sound echoing in our heads. The neighbour promised us he would check in on Husky once Husky had settled down. As we drove home with that god awful noise still reverberating in our heads we started thinking up ways we could keep her with us until we found a suitable home. Logically we knew husky was fine, emotionally we were drained. 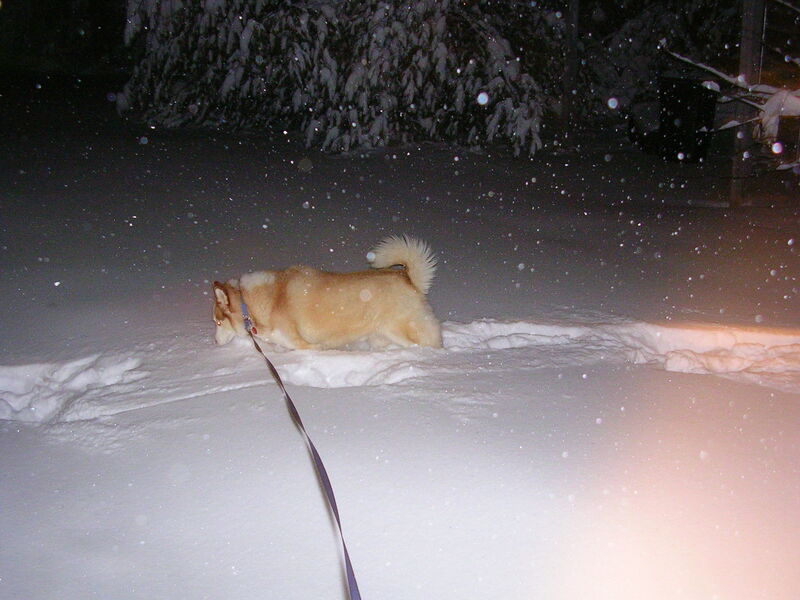 Some would argue that this was when we decided to keep Husky, and again they would be wrong. During this time we took Husky everywhere getting her as much exposure as possible figuring the more people who saw her the better the chance we had at finding her a good home. My wife was busy being a detective and with only Husky’s rabies tags she managed to uncover a lot of information. The previous owner owed the vets money, making them reluctant to give us any information, but with a little explaining on our part each vet we talked to agreed to release Husky’s records our vet. We found out that Husky was a mom but the dog law officer realized this guy was unable or unwilling to look after Husky never mind husky puppies and forced him to have Husky fixed. He did comply but once again never paid the vet. From there my wife was able to track down the breeder. Husky was a purebred and we got all the information we needed to get her papers from the American Kennel Club. We had no interest in getting her papers but it was a good ‘selling’ point to tempt a possible owner. Finding Husky an owner was a difficult task, we were not about to ‘dump’ her on just anybody, how would that help her? how would that put her in a better situation? Most people want a dog that they can throw out the door on a cold day and then give a whistle and the dog will come running back, unfortunately with most huskies you can’t do that, once they are outside and unrestrained, they are gone. Training a husky is not as easy as training a lab. Before a husky will do anything they ask themselves “whats in it for me?” and there better be something as they are certainly not out to please you. Huskies are not always good with children or other dogs and other dogs don’t always like huskies. In our studies we learned that huskies have their own language which other dogs don’t understand. A husky owner in northern Canada who has working huskies warned us that huskies play a lot harder than most dogs and the difference between husky play and a husky fight is the amount of blood spilled. To make matters worse our husky is very dominant and doesn’t play well with others. If another dog doesn’t respond the way Husky wants them too she goes on the attack. One Sunday we went to Sandra’s to drop Husky off, (thankfully we could now do this without the screaming) there was a pen set up in the yard with all the husky puppies playing inside. We brought Husky into the pen and she immediately went into mothering mode. She played with them, let them crawl all over her but when they crossed the line (as huskies are prone to do) she would roll them on their backs and hold them there until they calmed down. We stayed for a while, playing with the puppies (we really liked zag and Sandra actually tried to get us to adopt zag) and really enjoyed watching Husky play with the pups. Once again that dreaded time came when we had to leave we said goodbye to Sandra and the woman helping her, said goodbye to Husky who was only paying attention to the puppies but just before I got into the car I happened to look back and noticed Husky had stopped paying attention to the puppies, all her attention was on us. Later when my wife mentioned that particular behaviour to Sandra she told us that Husky always watched us leave and looked for us once we were gone and on Saturdays she would wait by the door for us to pick her up. I though back to when we first met Husky, she didn’t look at her previous owner, she never looked back. Some would say it was at that point we decided adopt Husky the truth of the matter is Husky had already adopted us. Just because this is a small town and the locals are all connected if not related It really is a small world doesn’t mean that it’s a tight-knit community. Five years back we were having a campfire with some neighbours one of which works at the university. I was working at the bank at the time and we started telling tales. Turns out my neighbour worked in the same office as Joe the bursar who makes daily deposits at the bank. Next day Joe walks into the bank and I mention that one of the people he shares an office with is my neighbour X.
Joe: “Oh” he says to me, “so you must live over on hill street” (location and names are changed to protect the guilty). Me: “Yes” my wife has always told me if you want to let a local know just where we live all you have to do is let them know that we are in the “Old Smith Place” so I was amused by the response. At this point my dear readers you have to know I am not always quickest horse on the track as Joe’s last name happens to be Hatfield. Me: “Yes Jane shares a property line with us, do you know her?” I innocently ask. “Really?” he says to me, “I don’t talk keep up with that side of the family if you haven’t noticed they are a little strange up there, see you tomorrow” and out the door he went leaving me scratching my head in wonder.